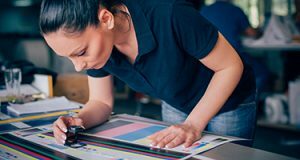 Let the printing professionals of FORMost bring your logo to life with a variety of materials and colors to make your business shine this summer. No matter where you plan to take your brand, highlight your business to potential partners and clients with high-quality large prints for event signage, outdoor display, and floor graphics for your storefront. In pairing your professionally printed business cards and marketing materials with great signage, your business will look polished and well represented for any networking or advertising opportunity. Let the printing professionals of FORMost bring your logo to life with a variety of materials and colors to make your business shine this summer. Are you taking your brand on the road? Be ready for your next expo or event with a great banner or poster designed and printed by FORMost! Choose from our selection of prints on paper or vinyl, as well as full-color two-sided banners to gain exposure and make your brand memorable at any event! We also offer full-color vinyl mesh banners to show off your brand at outdoor events and marketing, along with vertical retractable banners to stand alongside your booth at trade shows. Enhance the look of your business signage with a variety of large print mediums. At FORMost, there is no limit to the number of print mediums that you can choose from! Among our many types of signage available, choose from mediums such as PVC signs, yard signs, or sandwich board signs to draw customers directly to your storefront from various points around town. We also offer printing on magnetic signs that stick on cars and trucks, as well as window decals and clings for your car windows for advanced brand exposure on the road. For an added appearance of your brand in your business storefront, consider a high-quality floor decal. Floor decals are great for tying together the look of your brand colors, employee uniforms, interior decor, and logo into a single cohesive design and professional appearance for your business. This entry was posted on Friday, June 8th, 2018 at 2:39 pm. Both comments and pings are currently closed.